Nothing says paradise quite like an infinity pool where the edge of the water reaches the sea. 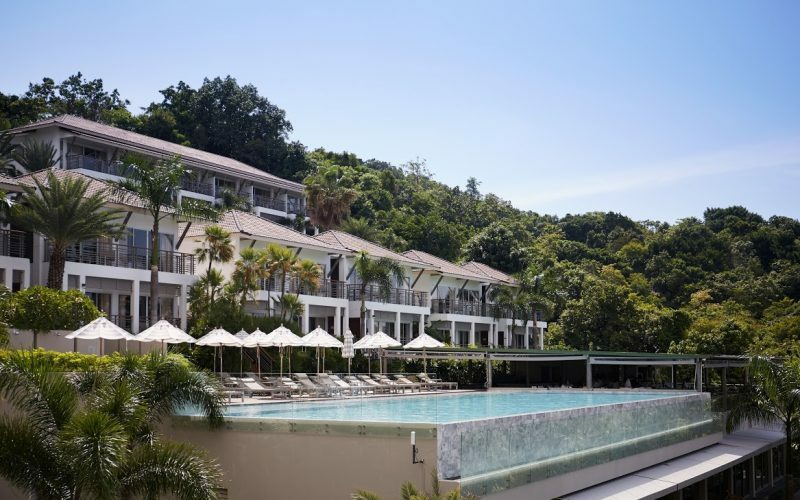 Mantra Samui Resort boasts a stunning rooftop swimming pool high up in the hills and gliding through the water with ease, like a knife cutting through hot butter under the baking sun, was most definitely a holiday highlight. Right by the pool is The View – the stunning restaurant and bar where there’s 20% off food between 5-7pm and 2 for 1 cocktails which are the perfect tonic after a long day of sunbathing on the comfy loungers. Our room overlooked the beautiful infinity pool – a spacious, stylish ocean view suite with floor-to-ceiling glass windows boasting spectacular views, a huge balcony and all the mod cons you could wish for – super fast wifi, two televisions and super stylish furnishings including a sofa big enough for six people to relax on comfortably. A calming colour palette of blues, greys and whites ensured maximum zen impact as soon as you arrived, while the bathroom was truly luxurious – an expansive space boasting a huge standalone marble bath and rainfall shower. The basin area with two sinks ensured there was plenty of room for toiletries, while the luxurious Charcoalogy range of products is provided complimentary of the hotel. A stones throw from the pool, is the Jai Spa. Filled with the aromas of lemongrass, turmeric and kaffir leaf courtesy of a vaporiser in the reception area, getting into full relaxation mode was easy. We enjoyed a 90 minute signature coconut massage called the Yaa Jai – This involved a gentle pressure point massage, before a hot poultice (which in this case was mashed up coconut wrapped in muslin) gave a deep heat medicinal muscle treatment all over the body. This technique dates back to the 14th century in Thailand, originally used to relieve battle injuries and still remains an integral part of their massage tradition today. Having never experienced this kind of massage before, I can testify that it was one of the best, and well worth visiting the spa for this treatment alone. After a wonderful nights’ sleep (400 thread count sheets and a 90 minute massage most definitely helped), waking up to the view of the ocean was the perfect start to the day. After a quick trip to the spacious air-conditioned gym which is fitted with all the equipment you’d need to keep that bikini body in shape; we hit The View for a sumptuous breakfast buffet set against the backdrop of those outstanding views. With everything from ham and cheese omelettes, to fruit, smoothies, pastries and classic Thai street food, you should definitely give the Jim Jum seafood hotpot a try for an authentic taste of South East Asia. Quiet and peaceful, yet still close enough to the Bophut Village and Chaweng to head out and explore (via the in-house transport service), Mantra Samui Resort is a true hidden gem with one of the best infinity pools I’ve ever seen. After two wonderful days in this tranquil retreat, I felt totally re-charged – the perfect start to any holiday. 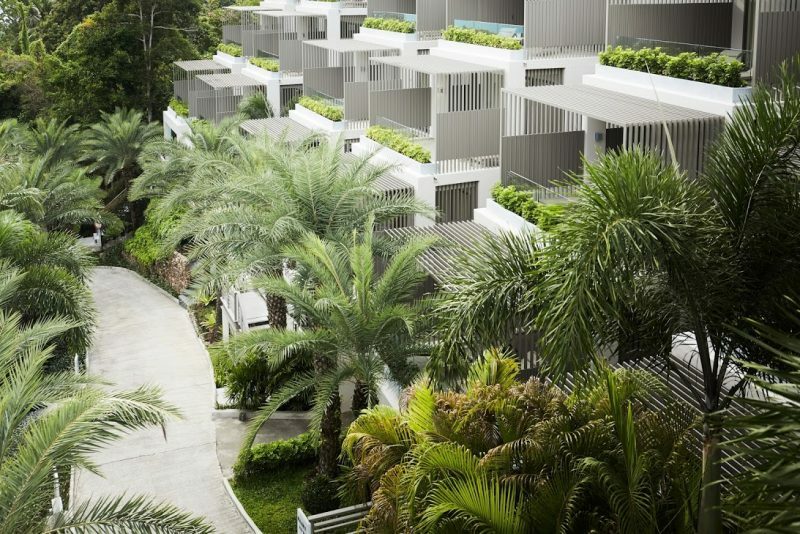 The Pullman Bangkok – A Haven of Innovation and Tranquility in a Crazy City!